Our mission is to engage in social activities, cultural studies and charitable work. GRATON AND THE CLUB: The Graton Community Club, recipient of the 1994 Western Sonoma County Historical Society Preservation Award, has played an important role in the development of the community of Graton. As recorded in The First Fifty Years: A History of the Graton Community Club, “The need for a community center and better surroundings for the children of Graton resulted in a group of parents banding together and organizing a club…”1 This support group for the local students was established on February 6, 1914 as the Oak Grove Home and School Club. 1914 was the same year electricity was brought to Graton. WHAT’S A CLUB WITHOUT A CLUBHOUSE? The Club members, mothers and fathers, initially met in a room at Oak Grove School but as the school’s enrollment increased they searched for a new home. 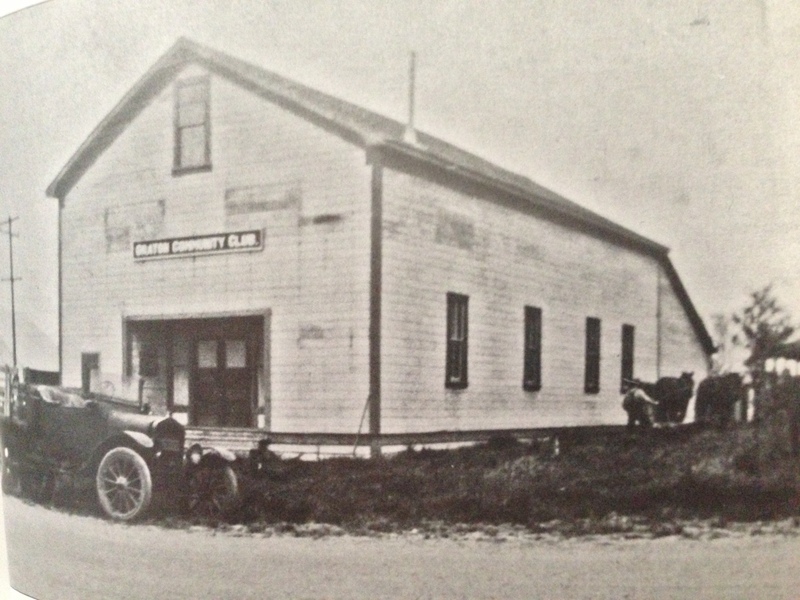 In 1916, they purchased a former chicken hatchery building near the railroad tracks for $500 to use as a clubhouse. When the land the hatchery was sitting on sold to the Sebastopol Apple Growers Union for $425, a team of horses moved the building up Main Street (now Graton Road) to its present location, three adjacent lots at the corner of N. Edison Street and Graton Road. It cost the Club $54 to move the building and another $13.30 paid to the railroad for damages incurred when the peak of the building caught on a cable wire suspended over the tracks just west of Ross Road, delaying the trains for hours. One of the lots at the new location was purchased by James H. Gray for $100; Mr. and Mrs. George D. Wirts and James Gray donated an additional lot each. Over the years the building has provided a local venue for parties, plays, teas, flower shows and plant sales, weddings, memorials and other family celebrations, townhall meetings and election debates, fundraisers and holiday celebrations. For many years Oak Grove School graduation ceremonies were held at the clubhouse. To cover costs and continuing operating expenses, space was rented to the precinct on election days and club members served lunch to the public. In 1945 a branch of the Sonoma County Library was sponsored by the club and housed in the annex of the clubhouse where it remained for at least 30 years. Regular plant sales began with the 1926 “wildflower show” where school kids participated with exhibits and dramatic programs. In the name of conservation, however, wildflower exhibits were discontinued. In 1928 the Club held both Spring and Fall Flower Shows along with tea, potted plants and bulb sales; and we’ve been doing so ever since—along with collectibles, crafts, raffle, and a luncheon in the dining room (available with tea, of course, plus coffee and homemade desserts). Local school children are always invited the day before the show opens to the public to see the exhibits and purchase plants and toys at very special prices. A TRADITION OF COMMUNITY GIVING: “While working so hard to get out of debt, the members never lost sight of the fact that they had organized for the benefit of the children of the community. …Hot chocolate and soup were provided on rainy days before school lunches were inaugurated. Playground equipment was purchased as there was no money available in the district. Eyeglasses were provided for many children. Boy Scouts and Camp-Fire Girls were sent to camp and helped with dues and craft materials.” 1 In 1954 the club gave the first scholarship, (link to scholarship page) an annual tradition that has helped hundreds of outstanding local SRJC scholars who have financial need to continue their education at a four-year college or university. In 1963 the Club established the Laura Griffith Huffine Memorial Fund to provide annual donations of science and nature books. Today those books are kept at El Molino High School’s reference library. Also each spring the Club gives to Sebastopol’s “Project Grad,” a program first begun on the east coast in 1980, as part of an Alcohol, Other Drugs and Highway Safety Prevention/Intervention Program to provide a fun, safe and sober alternative graduation night party. The Club also helps fund Oak Grove School’s art programs through their art association. PUBLIC BENEFIT CORPORATION DEDICATED TO CHARITABLE ACTIVITIES: In 1957, the Graton Community Club was incorporated, and in 2008, our tax exempt status as a 501(c)3 public charity was made retroactive to 1957. 1The First Fifty Years: A History of the Graton Community Club, Alazuma Singmaster and Della Hallberg (Club historians since 1947), 1966. Conversations with Hazel Singmaster Jens, 1994. Graton Historical Photo Calendar 1995, Merrilyn Joyce, Margie Nelte and Judy Christensen, 1994.